Doodling is the visual equivalent of tapping your pencil on your desk while waiting for a website to load or whistling an aimless tune as you scrub the toilet. Take a look at any of your notes from work meetings or any of your personal notebooks, and you'll likely find all manner of squiggles and lines, circles and boxes, fancy lettering, and distracted stippling. The fact is, most of us doodle, even if we're not consciously aware of it while we're doing it. And while your boss may frown on you for doodling while she drones on and on in a meeting, drawing little creatures, mazes, flowers, or bubble letters may actually help you focus on what she's saying. In a 2009 study published in the Journal of Applied Psychology, participants who were asked to doodle while listening to someone reading a list of names were able to recall 29 percent more of the names later on, compared to those who didn't doodle. Another study, published in 2011 in the medical journal The Lancet, concluded that doodling may help keep your brain active in the absence of outside stimuli by engaging the default networks in the cerebral cortex and absorbing your nervous, bored energy to help you maintain the ability to concentrate. These and other studies have led researchers to believe that doodling is an effective learning aid that may help students visualize material later on. 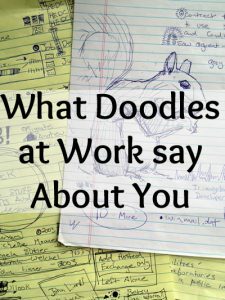 But the question here isn't whether you doodle, or why you doodle, but rather, what do your doodles mean? Much like dream interpretation, interpreting your doodles is less of a science and more of a matter of making broad generalizations. While the 2011 study in The Lancet points out that research doesn't support the idea that doodles provide a window into the soul or psyche, handwriting experts say that translating doodles and unlocking the secrets behind them is similar to analyzing handwriting. Sheila Low, the author of The Complete Idiot's Guide to Handwriting Analysis, points out that there are some basic shapes that can provide insight into the personality behind the doodler. For example, circles and other rounded shapes may indicate a need for love, while drawing square shapes and lots of angles could point to a need for security. Wiggly shapes and those that combine circles, squares, and squiggles may indicate a creative nature. The size and placement of the doodles also has meaning. Doodles that take up a lot of the page may suggest that you're attracted to nature and may be introverted, and small doodles off to the side may indicate that you're tidy and organized to a fault. Doodles in the middle of the page might mean that you're an extrovert who likes attention, or it could mean that you like your personal space. Doodles at the top of a page could indicate that you're loaded with good ideas and have a lot of confidence. Those on the right side may be communicating secret thoughts, while those on the left may mean that you're nostalgic by nature. Emma Steiger, author of the 2004 book The Science and Psychology of Doodles, studied the most common doodles and assigned meanings to them based on the works of Sigmund Freud and Carl Jung. Writing your name in big letters may mean that you have an over-the-top personality, while writing it in small letters may indicate that you have low self-esteem. Drawing a circle around your name could mean that you feel isolated, while drawing a circle around someone else's name may indicate that you're feeling defensive. And if you draw a line under your signature, you may have an inflated sense of self-importance. Boxy shapes could indicate that you're practical, while triangles may mean that you're pretty hard on yourself. Vegetables may be telling you that you're satisfied with the material aspects of your life, while fruits may indicate that you're more interested in the sensuality of existence. Hearts may signify a daydreamer, a happy relationship, or a romantic nature, and human figures may reflect the way you feel about yourself. Stick figures may symbolize innocence, and big eyes could reveal that you're sensitive by nature. Small eyes may represent an introvert, while closed eyes may indicate that you're a bit shallow.